Perios now offers the Perios Activity Learning Kit! For parents and educators interested in learning more, browse through the tabs below. 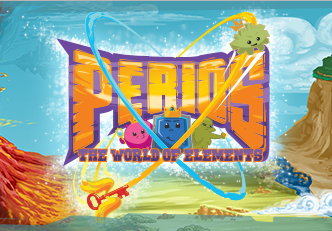 Perios is a concept game and activity series developed to teach children the basic building blocks of chemistry and have fun too. To do this, we have created interesting fictional characters called Perios, which are named for the elements in the Periodic Table. For example, Carbo, is named for Carbon. The characters have symbols, signs, traits, and powers that are similar to the elements they represent. The Perios belong to clans that match the vertical valence column "Group" of the Periodic Table. The clans live in different regions of the fictional Perioland. The goal of Perios is for children to learn the Periodic Table of Elements when they finish grade school. The objective of the first Perios game is to learn the names of the characters, their clans, and where they live. The game also introduces additional characters based on chemistry, such as Thermos (temperature), which slow or speed the Perios and Freenerkies (Free Energy) which sets them free. There is even a busy Professor who offers hints about the game. A second game, PerioPop, is an advanced chemistry puzzle game. Players have to match the Perios (or elements) to their clan (group) and make the required compounds to pass each level. PerioPop's goal is to teach some basic compounds associated with each element. Hydi Gets an X-Ray is the first Perios animated reader. The story introduces most of the Perios regions. Hydi runs into trouble on her trip across Perioland and learns that she is made of one proton and one electron. The periosworld.com website provides supplemental information about Perioland and the Perios characters which enhances the science learning experience. Additional games (in development) build on the first game and expand the use of chemistry principles. Perios is available from this website and also on mobile apps, Android via Amazon or Google Play, and iOS via the App Store. There are no IAPs (In App Purchases) to be monitored in either version.